Today, women turn to magazines—Elle, Vogue, and In Style—to learn the best hair and cosmetic tips. They also visit their favorite dermatologist. 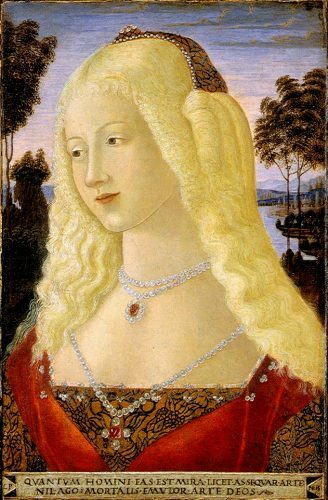 In Renaissance Italy, cosmetics and hair care were very much part of the conversation of the nobility. 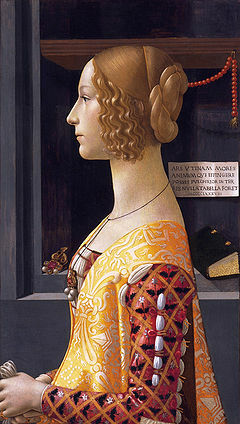 Caterina Sforza, after she retired from defending the castle and married a Medici, developed her own line of herbal cosmetics and put them in a book, Gli Experimenti (1490). 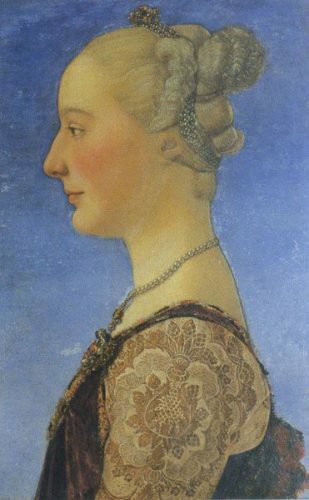 Isabella Cortese, an Italian Renaissance alchemist, wrote her own book in 1561: I secreti della signora Isabella Cortese (The Secrets of Lady Isabella Cortese). 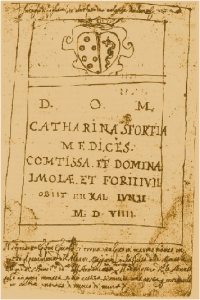 But before Caterina and Isabella there was a doctor in Salerno who did the research and wrote a health and beauty treatise that was followed for four-hundred years, De Ornatu Mulierum, one section of what became known as the Trotula Minor. 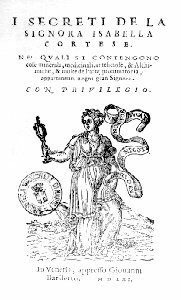 Trotula de Ruggiero, also known as Trotula of Salerno, was reportedly born around 1090, into a wealthy family, which must have encouraged the education of women. In a lucky accident of historical timing a new medical school was built in Salerno in place of a Benedictine monastic dispensary dating back to the late 700s. La Scuola Medica Salernitana condensed the knowledge of old treatises of Latin, Greek, Arabian and Hebrew medicine. It was the most important school of medicine in Europe in the Middle Ages, the predecessor of the modern medical university. It was the first academic institution to offer degrees and boasted a very inclusive approach to medicine, fusing three scientific traditions—European (based on the classical Greek and Roman knowledge), Islamic and Jewish. Its most progressive feature was that, unlike other schools at the time, women were permitted to study there and even teach. Trotula stood out from her contemporaries. She became a professor at the school. She reportedly wrote the Trotula Major and Trotula Minor, a group of treatises on women’s medicine. (Recent research questions the attribution to one person.) Over 100 manuscripts of the De Ornatu Mulierum, devoted to beauty maintenance, were circulated throughout Europe for several centuries. Bleaching and coloring hair took five days. The bleach was made from walnut shells and the bark of the same tree, boiled in water to which “alum and oak apples” were added. The mixture was smeared through the hair, then covered with leaves, tied with strings and left for for two days (except when exposed to the sun, see below). The excess was combed out and for three days thereafter the hair was colored with a paste made from “oriental crocus, dragon’s blood, and henna mixed with brazilwood.” The final step was a thorough rinse with hot water. Lengthy hours in the hot sun served as the heating mechanism that activated the “bleach” (the concoction described above for the first two days), were necessary. The process was difficult because upper-class women also wanted to keep their skin paler than pale. Therefore, they had to sit outside for hours fully covered to protect their skin with hats to protect their faces. 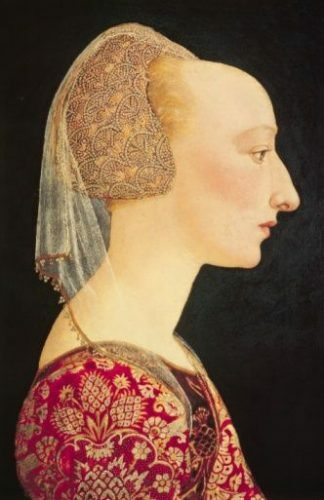 The hat, called a solana, had the crown cut out in order to allow exposure to the sun’s rays to bleach the hair. 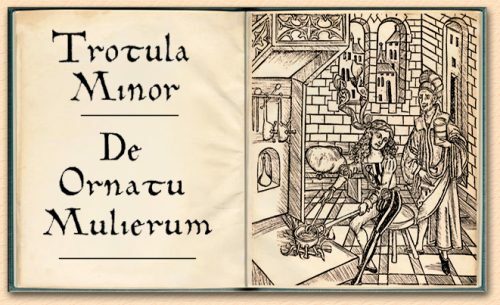 To cover the gray in black hair, De Ornatu Mulierum said to apply a mixture made by cooking “a green lizard in oil without its tail and head.” Then, oak apples were to be placed with oil in a dish and “let them be burned.” The ingredients were pulverized and mixed in vinegar with “blacking made in Gaul.” The paste was applied to the hair and left until all the gray was gone. To encourage hair growth the treatise said “take barley bread with the crust, grind it with salt and bear fat. But first burn the barley bread. With this mixture anoint the place and the hair will grow. In order to make the hair thick, take agrimonies and elm bark, root of vervain, root of willow, southernwood, burnt and pulverized linseed, and root of reed. Cook all these things with goat milk or water,” and apply to the head. 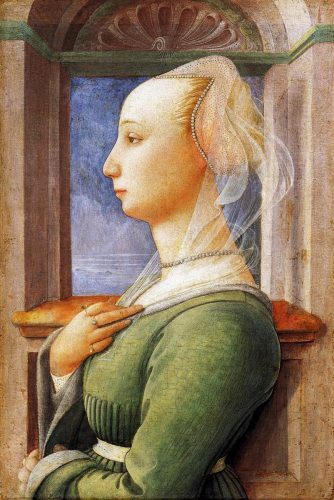 The upper-class Renaissance woman sought a high hairline, since a wide and high forehead was thought to be trait of intelligence and beauty during that era. Those who were not blessed with a naturally high forehead plucked their hairlines in order to get the desired effect. Then the area was rubbed with a pumice stone to hide any evidence of tweezing and to assure that no lines marred the brow. Thin light eyebrows were mandatory, so they were tweezed and bleached or cut to make certain that they were not too prominent. (Check out Mona Lisa’s lack of brows.) Eyelashes were to be short and thin, certainly not lush and long as is popular today. Trotula’s work was translated to English in 2001 by Monica Green. (A Medieval Compendium of Women’s Medicine. Edited and translated by Monica H. Green. (Philadelphia: University of Pennsylvania, 2001).